The Walking Dead has never been great with fleshing out specific groups of antagonists, at least beyond a charismatic leader. After the Governor, our most personable threat came in the form of Terminus leader Gareth and his cannibalistic ilk, though even then, the threat only lasted a few episodes. The Saviors too have proven colorful by what we’ve seen, first as an energetically menacing motorcycle gang, then last week in part as macabre brutes, and it seemed like the capture of Carol and Maggie might have offered a clearer window into their mindset. It’s no accident that the group capturing Carol and Maggie is comprised almost entirely of women either, save for a wounded man that Paula (Alica Witt) later dismisses as someone to warm her bed. If we’re tying the “Saviors” to the same women Daryl encountered fleeing alongside “Dwight,” it doesn’t seem as if Negan’s group holds many women in positions of power, that “The Same Boat” seemed poised to borrow from the badasses of Mad Max: Fury Road in exploring that side. The unfortunate reality is, that “The Same Boat” never figures out exactly what it wants to say about them before everyone ended up dead, as often besets The Walking Dead. The emphasis continues to fall on Carol after last week, far and away the most interesting aspect of tonight’s hour, to see her breathlessly shift into a meek Christian mindset in exploit of her captors. It weighs on her to outwit their assailants so deftly, again calling back to the ever-growing number of the living she’s killed. 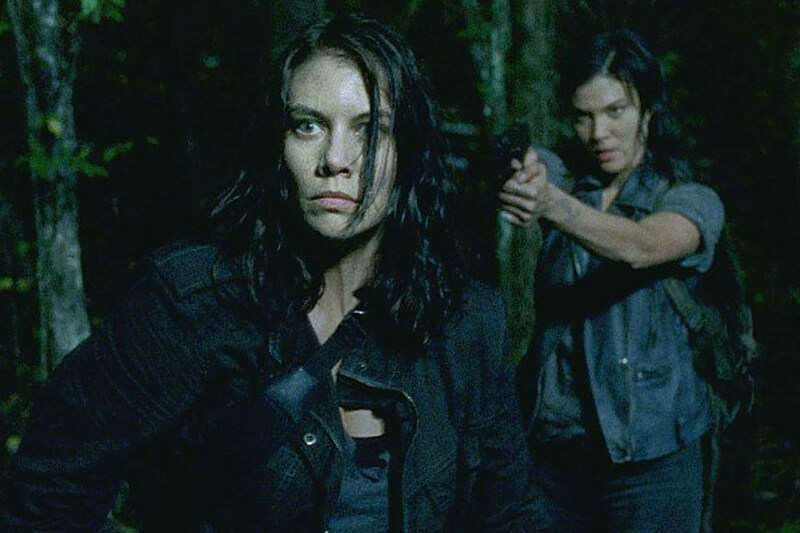 There’s a marked difference between the ease with which she kills one Savior for slashing at Maggie’s stomach, versus throwing Paula to the walkers, or flicking a lit cigarette to immolate the reinforcements that arrive thereafter. Perhaps Morgan’s words have finally started to weigh, that we see her clutching the rosary to the point of drawing blood when Rick guns down their sole remaining captive, but “The Same Boat” didn’t make its case too clearly. On the other side of that kill floor, Maggie too seems to have come to the realization that she wants to put her “choosing something” first, breaking down in Glenn’s arms at the end with a suggestion that she can’t endanger herself with this type of violence anymore. Both Carol and Maggie make it through the hour mostly unscathed, with seemingly all other women and Saviors alike put down to avoid causing any further trouble, leaving the hour’s consequences somewhat moot anyway. If nothing else, it’s at least of interest how “The Same Boat” seemed to flesh out a bit of the Saviors’ almost-religious devotion to Negan, that both Paula and Primo invoked the same “We’re all Negan” mentality. One imagines Rick and others would presume to have taken out the man himself, perhaps letting their guard down for the final three hours of Season 6, even if Carol might speak up to mention Paula’s same claim. If there’s anything The Walking Dead struggles more with than opposing groups, it’s masking an attempt to spin the wheels for another hour. Paula and her particular band might have made for an interesting contrast to the Saviors we’ve met thus far, if only given the time to unfurl, and it’s strange that even a bottle episode of sorts couldn’t keep up the character work. At least the Saviors are almost frighteningly organized, to utilize such complex walkie-talkie communication and codework. Considering Rick and the others showed up to the facility, had they never intended to meet Paula’s group in the field, or had they waited there, then decided to infiltrate on their own? The Walking Dead will return on March 20, airing at 9:00 P.M. on AMC.